When your construction project requires the expertise and resources of a seasoned crane operator or dewatering company in Minnesota, North Dakota, South Dakota or Wisconsin, make sure you’re calling Hibbing Crane Service first, above all others. Our tenure within the industry has made us a foremost resource for critical construction services and our penchant for providing a safe, efficient and thorough level of workmanship has garnered us a superior reputation. Moreover, our capabilities are designed to meet the needs of any jobsite, big or small! From lifting capacities of up to 150 tons, to all-terrain capabilities from our boom trucks and truck cranes, we’re ready to assist you. At Hibbing Crane Service, we understand that crane-related jobs not only need the right crane size, but also the right planning, rigging and certified operators to follow through, all while working in a safe and timely manner. All of our operators have years of experience with us and a thorough track record of safety, alongside credentialing and certifications in compliance with ANSI, NCCO, OSHA and MSHA. 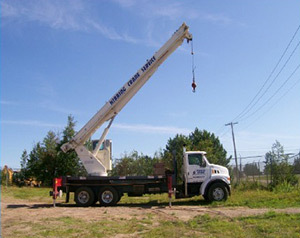 You can rest assured that any personnel, cranes or construction dewatering pumps in Minnesota bearing the name “Hibbing Crane Service” are going to come backed by a reputation for excellence that’s simply unbeatable. All of our operators are National Commission for the Certification of Crane Operators (NCCCO) certified. We have our Master Plumber License, 2A Boiler Engineer License and High Pressure Pipefitting License. We’re members of Operating Engineers Local 49, as well as Plumbers Local 589 and Steamfitters Local 11. We’re happy to provide you with a lift assessment, to ensure correct crane selection and rigging for your project. We’re centrally-located in Northern Minnesota, allowing us to serve an expansive area. From mine and construction dewatering services, to rigging and lift assessments, we’re pleased to assist you in the surveying of your unique project’s scope. Contact us today!